Ivan Long was born on South Dakota’s Pine Ridge Indian Reservation in 1962. As a child, he grew up amongst the tribal elders. He heard their old stories and participated in many ceremonies, some of which are no longer practiced. Through his childhood memories, the combination of his heritage and his love for horses, he developed a gift for painting. As a self-taught artist the canvas is where he tells his stories. His art talks about the contemporary Native American of today. His art reaches into the past inspiring a more positive approach to the viewer. “I have painted most of my life. At first, I thought the only true art was realist painting, never considering any other style. Although I had great satisfaction in painting that way, I needed to say more,” the artist said. 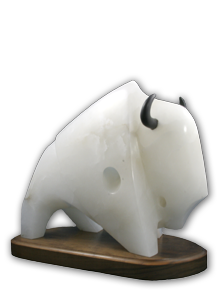 Long was awarded Best of Show at the Great Falls Native American Art Show in Great Falls, Montana in the spring of 2000. Later that year, he won first place in the Watercolor Division at the Red Cloud Indian Art Show in Pine Ridge, South Dakota. Long’s work can be found in permanent collections in Montana and South Dakota, as well as numerous private collections. He currently resides in Roberts, Montana.